Tough emotions are part of our contract with life. Each time a CD is released (and “Nowhere to Hide” is my 9th, or 10th if you count the Christmas is Here EP which was digital only), I go through a post partum depression of sorts. There is a huge build up during the months preceding the creative “birth,” and then after first week sales and the CD release party, the powers that be are onto the NEXT (unless of course, you’re on the top of the charts or get some big “break”). No artist can depend on the industry’s notoriously fickle adoration. For the artist, once the record comes out, the work has just begun to keep the project relevant. We virtually tour on social media, and we physically hit the road playing shows to say “look at my baby!” These days it’s “Ok, so you don’t own a cd player and you play me on Spotify. I get it. So how ‘bout a t-shirt? Or a show ticket? A cookie?” Having been in the music business professionally for over 20 years, I can honestly say that it’s harder than it’s ever been. But at the same time, the playing field is wide open if you’re willing to do the work. The HARD work, the never ending work. And it’s not for the faint of heart, or ego. This is a typical scenario: The Entertainment Industry holds your favorite treat of all time in front of your nose. And each time you (the artist) get closer, the treat is pulled back just slightly. They lure you in, closer and closer and closer. As soon as you taste the treat, they grab your soul. When they’re done with your soul, they hand you back only an ego that has been tread on by their own. It’s uncomfortable, it hurts, and it’s heartbreaking. Artist then searches for their soul to reclaim. The industry is not pure evil. I’ve truly met some of the greatest people I’ve been blessed to encounter. But the bad eggs are, well… disappointing. As an artist, I must remember that I do not serve the Industry – I serve those who have made my music part of the soundtrack of their lives. Yes, an artist needs to monetize in order to keep serving. We need to monetize to feed families, stay healthy and take care of ourselves and each other. But, I don’t do this for the money, I do it because I HAVE to. This life I’ve chosen as an artist – it’s a Calling. I write songs and sing because if I didn’t, I’d emotionally and physically, spontaneously combust. I can hear my husband reading over my shoulder saying “You’re a Drama Queen. “ Yeah, but you wouldn’t have me any other way! And this crazy play is my Life, and I thank G-d that you’re all a part of it. I’ve been writing a lot over the past few weeks, and if you join me on Instagram @pnutsings, you’ll find that I’m writing songs in front of you. You’ll read lyrics in process and experience my mind working through life and images and turning them into song. Hope to connect with you there- I enjoy watching everyone’s posts and what images captivate YOU. I am not fighting the future – Spotify is here to stay and I’ve started making playlists and discovering new music. I’ve got you covered if you’re celebrating Valentine’s Day OR Single’s Awareness Day. If you use the platform, PLEASE follow my artist page. My label will be happy. Yes really! Blue Élan Records has found some benefit to the platform’s “discoverability” element. In other news, I’m adding tour dates constantly and I’ve planned an online concert for 3/11. 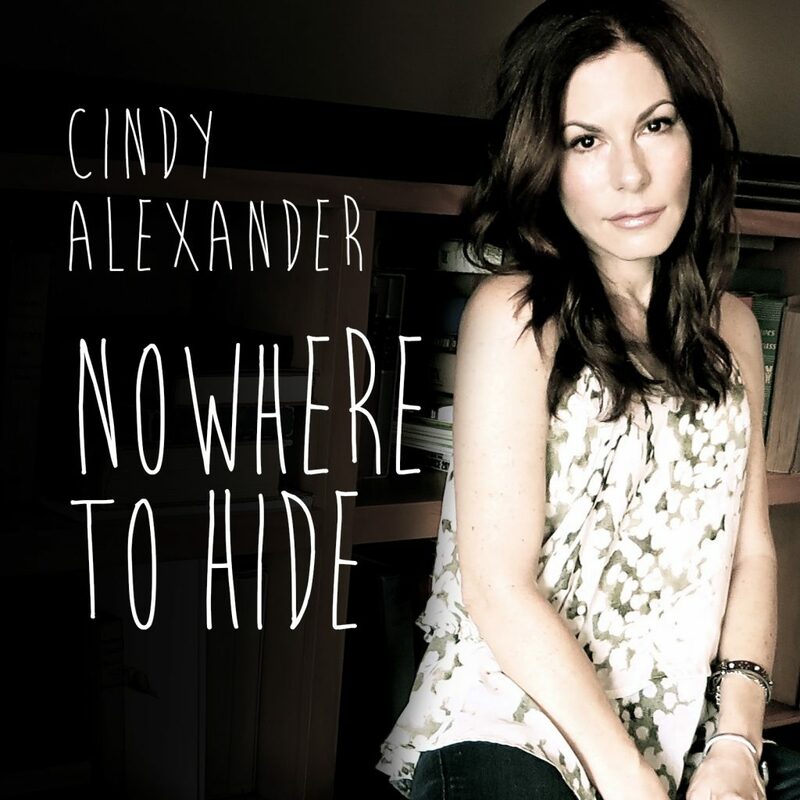 If you post a picture of yourself on your socials with some CA Nowhere to Hide merch/swag and the hashtags #nowheretohide #cindyalexander, we’ll find you and send you the invite/password to attend. We’ll draw a name out of the invitees to choose the set list! 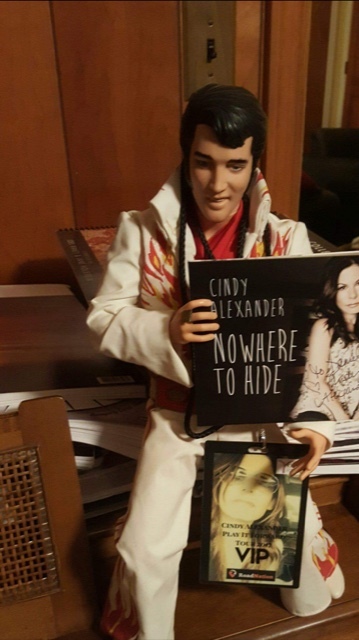 If you don’t want to use your own image, get creative like Daniel Molinares – the pic he posted with Elvis makes me smile every time I see it. And now, I’m turning off the phone and the computer and going for a hike. Nature is my temple. And sometimes, as much as I crave connection, I need space. Do you ever go off the grid? And if you do, where do you go and how do you quiet your mind? Thanks for reading Please stay in touch ~ I love hearing from you. Hope to sing for you in person soon!